Robert E. Howard’s legendary warrior king returns! Kull of Atlantis as been called from his mysterious mirror limbo throughout America’s history to wage battle during major crisis events—so-called Fourth Turnings—that mark the death of one age and the birth of another, greater one. Now, the time as come for the final Turning… but can Kull survive America’s greatest crisis and claim his long-prophesied New Atlantean throne? In September of 1929, the magazine Weird Tales published a short story entitled The Mirrors of Tuzun Thune. One of only three stories of Kull published before Robert E. Howard’s death, it shows us a man of action trapped beneath the weight of his own triumphs and looking for some deeper truth. Invited to visit the home of the wizard Thune by an unnamed (at the time) young woman, Kull spent many days neglecting his duties as King of Valusia, sitting in front of a mirror as he tried to uncover the mysteries he found therein. After a while, Kull started to doubt his place in the world… was he staring into a mirror, or was he actually the reflection looking out? 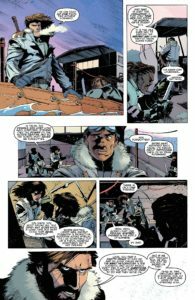 On the last day, just when he felt that he was about to discern the true nature of the world and his place in it, Kull is pulled away from his contemplation by his most trusted friend Brule. The wizard Tuzun Thune lay dead on the floor, and the girl who had lured Kull to the House of Mirrors crouched before him, waiting for the King’s final judgment. The story ends with Kull still wondering about those last moments. Was he being pulled into the mirror to be trapped for all time, or was he on the verge of some great revelation? Robert Howard never went any deeper into that story, never enlightened readers as to what he’d intended as an explanation for what Kull experienced during his visits to Thune’s home. Eighty-eight years later, IDW Publishing and writer Tom Waltz are giving readers an entertaining “what if…?” story. 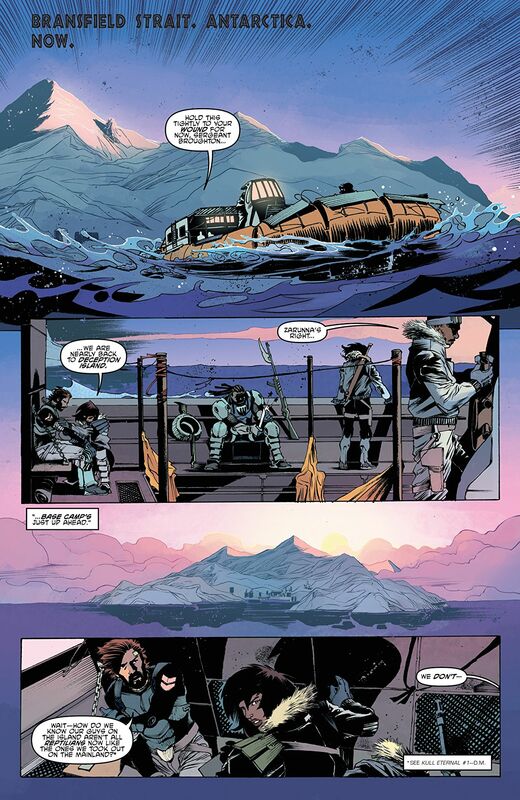 The first issue introduced Kull as a modern day warrior facing serpent men in defense of an installation in Antarctica. Fighting at his side, as always, were Brule, and a mysterious woman named Zarunna. Also in the opening issue, Robert Howard’s original story was touched on as we took a trip back through time to see Kull as longtime fans have always known him, sitting on his throne and pondering his existence in sullen introspection. We see the supposed slave girl, Zarunna, telling Kull about the House of Mirrors and revealing that the wizard Thune is her father, a member of the race of Elder Men, and the keeper of a great many secrets. 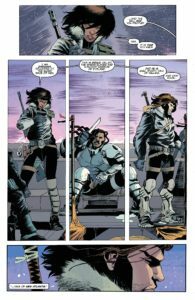 In the second issue, we’re shown exactly what was going on during Kull’s contemplation of the mirror’s reflective surface. He is destined to step through time, to historical turning points essential to the rebirth of a New Atlantis, and to someday sit on a new throne. Like many, the works of Robert E. Howard were my introduction into the genre of “sword and sorcery”. 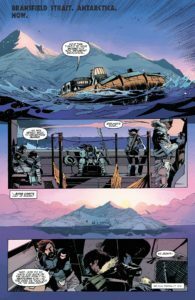 Far more cerebral than many gave him credit for, Howard’s world of the Hyborian Age is filled with danger and intrigue, monsters and villains, with proud heroes rising up to face it all. Most well-known is, of course, Conan. Only slightly less so is Kull the Conqueror, last known survivor of the lost kingdom of Atlantis and the more introspective precursor to Conan. Many longtime readers actually believe Kull to be the prototype for the more popular Conan. Turns out, Tom Waltz was one of those very fans who was never able to fully leave Howard’s works behind. Thankfully, he didn’t really have to. Building on the original story of Kull and Tuzun Thune’s mirrors, Waltz pays all due respect to the work as he crafts his own idea of what may have happened in that chamber, complementing Howard’s work rather than contradicting it. He’s constructed an interesting take that has the sword wielding conqueror of kingdoms facing off against mercenaries in the modern day, and then marauding Hessians during the American Revolutionary War. It’s the kind of story that’s been done to death, taking a character out of a primitive fantasy setting and dropping them into modern times, but Waltz takes the time and effort to do it with a little more thought, and in my opinion much more success. More than just a stunt or gimmick, it’s a speculative re-imagining, and Waltz has taken the time and effort to ensure that his story holds up side by side with the source material. 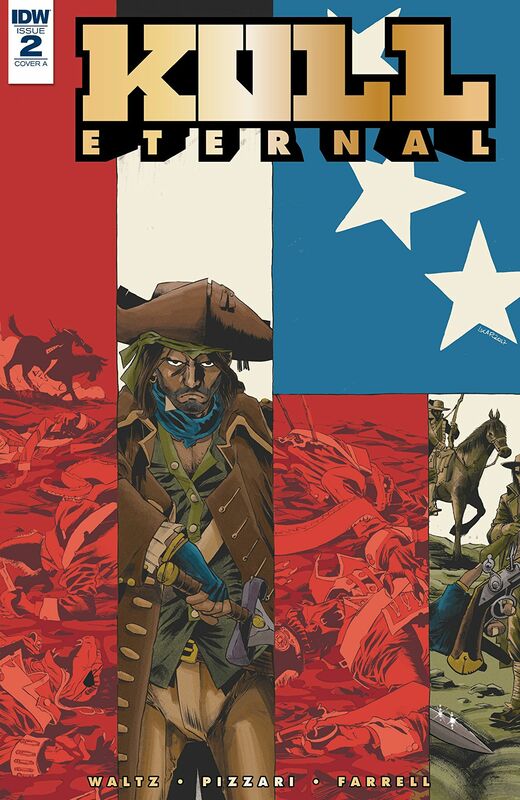 I know this for a fact, because I went back and read The Mirrors of Tuzun Thune again, after reading the first issue of Kull Eternal. 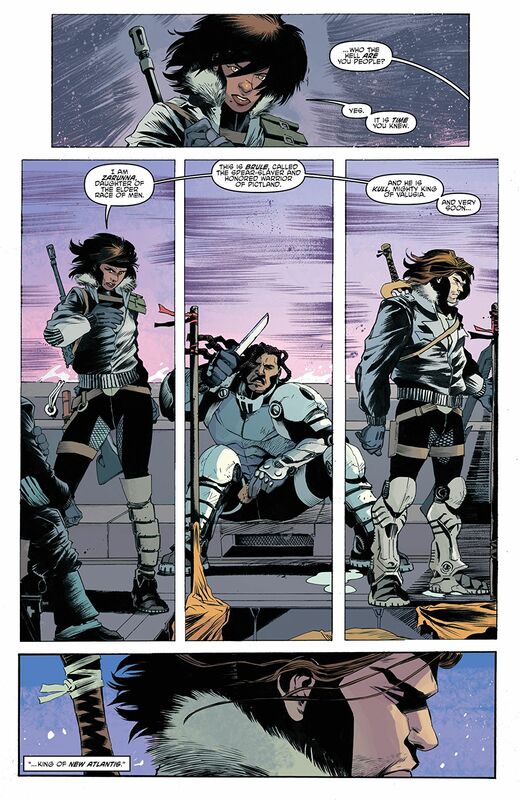 The artistic team of Luca Pizzari (illustration)& Triona Tree Farrell (colors) have taken up the challenge of adapting the sword swinging Kull and his companions to different settings and eras. Swinging seamlessly from ancient Valusia to modern Antarctica, then to the Revolutionary War and the banks of the Delaware River, Kull and company take the fight to all enemies and look damn good doing it. It’s the kind of job that provides a different set of challenges, and Pizzari has put his pencil/pen to it. The action is fast and brutal, leaving no doubt that Kull’s sword is in no way outmatched by more advanced weapons. Farrell’s colors bring it all to life, every arterial spray reinforcing the fact that war is best left to the barbarians. Kull Eternal revisits a personal favorite of mine, and opens the character up to a whole new set of challenges to conquer. Fans of Robert E. Howard, or that brand of roughhewn fantasy in general, should be happy with what’s being done here. As for any new or prospective readers out there, take a look at what IDW has given us, and then challenge yourself by comparing it to some of the original works it was based on. I don’t think you’ll be disappointed.